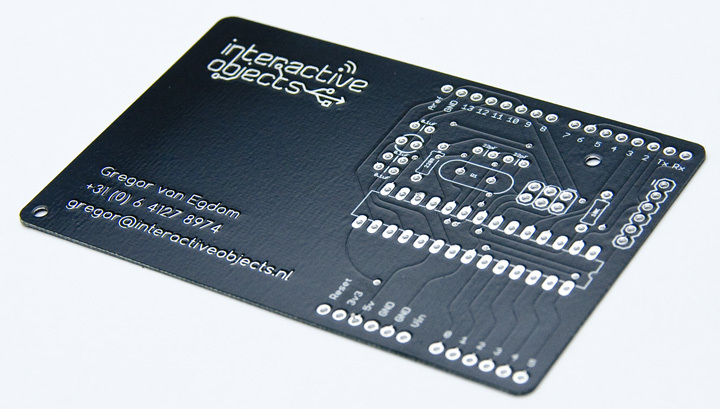 InteractiveObjects » Introducing the BusinessCarduino, world’s most versatile business card? 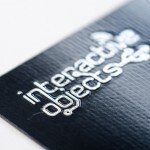 At Interactive Objects, we needed a new business card. Business cards have been the method of leaving a token for keeping in touch. Despite all the prophets declaring it dead every decade with vCards, Bumps, etc., the traditional, physical business card is still going strong. 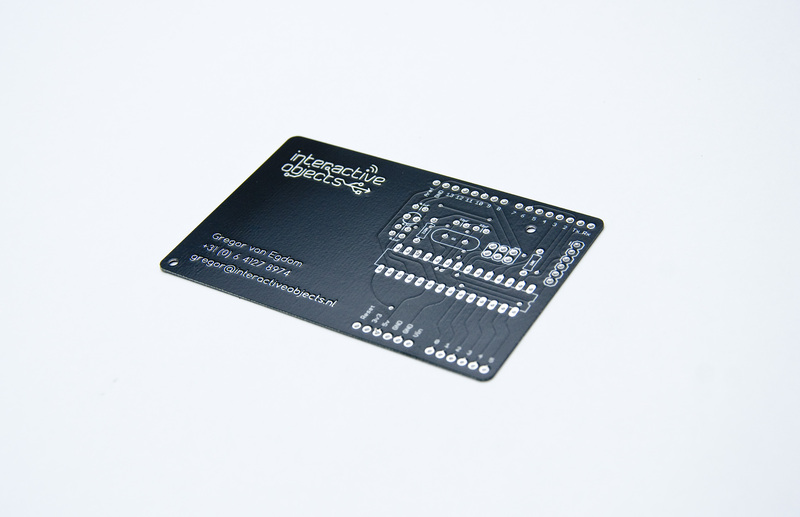 We wanted to create a business card that is more than just a piece of paper. 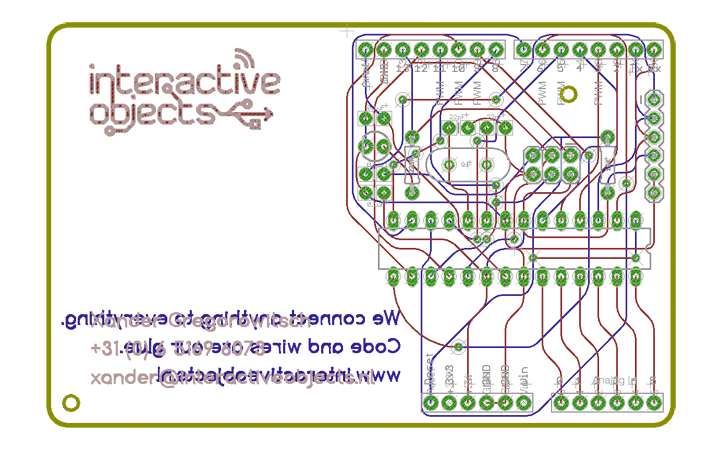 We’ve long revered the print-like quality of printed circuit boards (PCB’s). 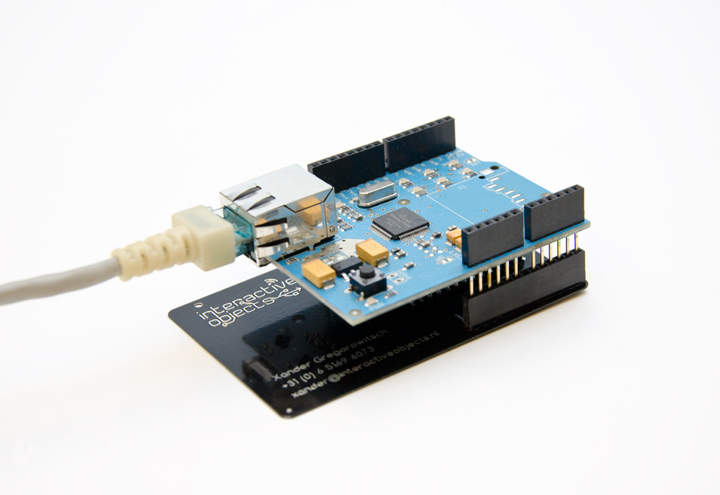 We use the Arduino platform in a lot of our projects. 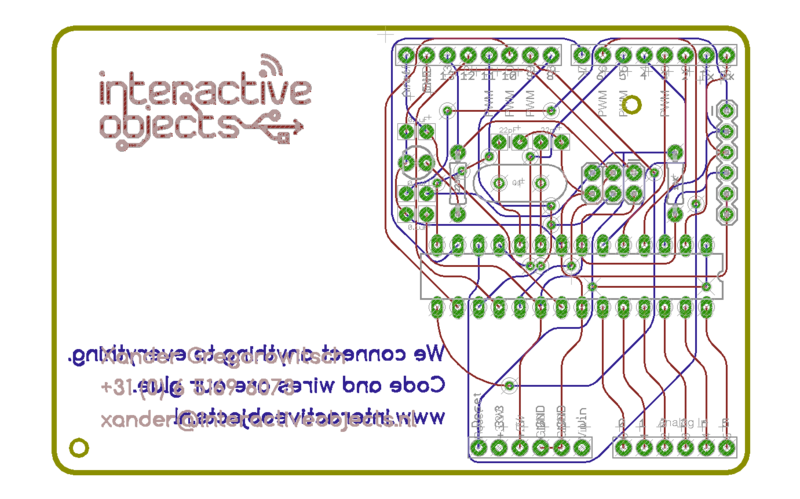 And a happy coincidence: the board layout of an Arduino snugly fits the size of a traditional business card (85 x 55mm). The idea was born to hand out one of our most important tools to the people we meet. 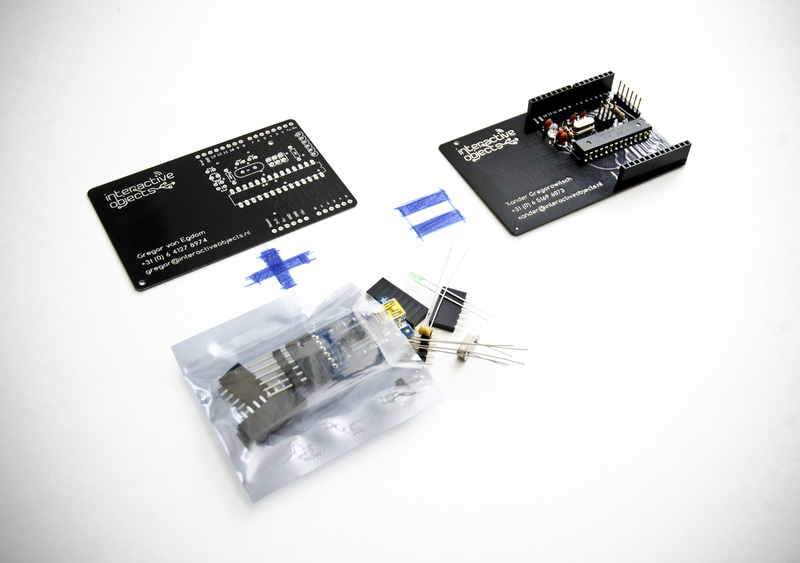 If someone who got our business card is interested, we’ll also give them a small bag with components and instructions on how to assemble and use the card as an Arduino. The board layout was done in Eagle. Since Eagle does not support custom typefaces, we used Illustrator and todbot’s excellent DXF-import ULP for the logo and contact details. 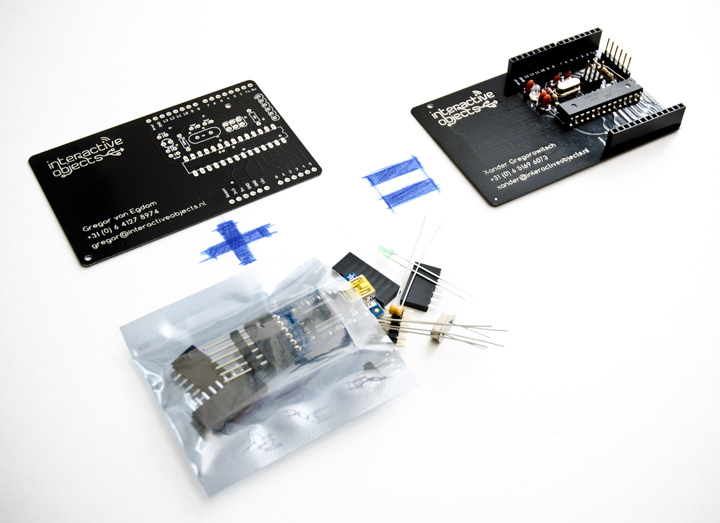 The Arduino layout is based on components from Sparkfun’s Eagle libraries. 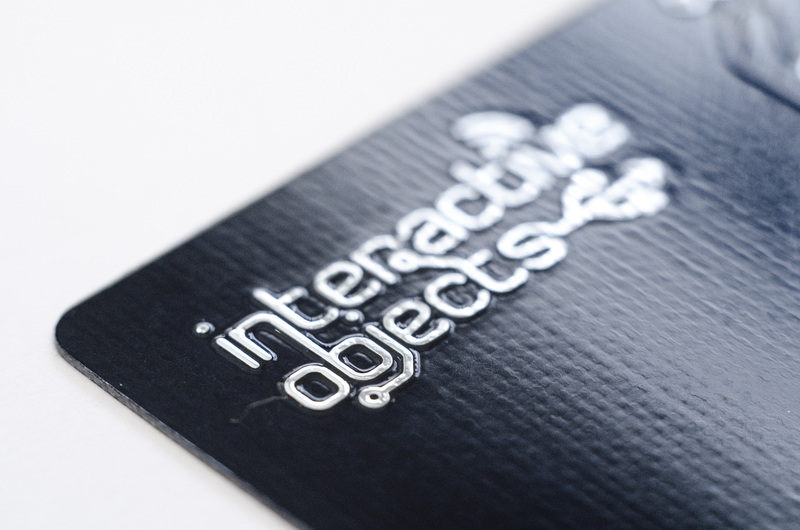 We’re pretty confident that this card is the most versatile and useful business card ever! There are hundreds of thousands of open source projects with Arduino, it’s compatible with hundreds of shields and will suit many beginner and advanced projects. Let us know what you think! Nifty, maybe some prototyping area under the logo? Thanks! We could have included that, but we like it better like this visually. I’ve just stumbled across this page, the business card is amazing. At only 0.5mm! If only it was easy to get a .5mm pcb here in Australia….. Thanks! Regarding getting thin PCB’s to Australia; Dirtypcb.com and makepcb.com should be able to ship to you?